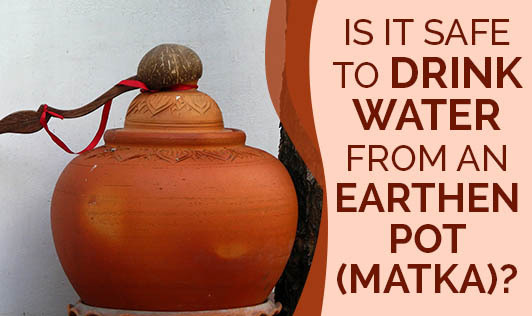 Is It Safe To Drink Water From An Earthen Pot (Matka)? Some of you, in your childhood, might have used an earthen pot (matka) to store drinking water in summer. Did you ever wonder about the hygiene of this process? Probably not. I'm not sure if any research has been done on the safety of cooling and drinking water from a matka, but I don't think many of us fell ill by drinking cold water from a matka. Indians have believed that matka water is a safe and better way of cooling water than a refrigerator! The science behind the mechanism of cooling water in a matka says that the matka absorbs some of the water that is poured into it. This is what makes the matka wall moist. The external heat evaporates the moisture on the pot and this cools the stored water to a comfortable temperature. This effect lasts as long as the wall of the pot is moist. Traditionally it was believed that people who drank water from an earthen pot had less chances of developing throat infection compared to those who drank tap water or water from the fridge. I'm not sure if science has proved this yet. One thing is certain that storing water in a pot not only cools water but also saves electricity. If you are unsure of water safety, perhaps you can boil water, bring it down to room temperature and then cool it in a matka. Do let us know if you use one and whether you like the matka water or not.